In a section on church government, Herman Bavinck begins to elaborate the Reformed view in contrast to a number of others by reflecting on the nature of Christ’s kingship and kingdom. Simply put, this is one of the most majestic passages I’ve ever read on the subject. The Reformed, thanks to their deep sense of the sovereignty of God, understood this. Those who proceed unilaterally from the goodness or the love or the fatherhood of God do not come to this understanding. But those who do not just highlight one of God’s attributes but bring all his attributes to the fore and proceed from God as [the living] God have no choice but to subordinate all creatures to him, in dependence and humility. God is sovereign always and everywhere, in nature and grace, in creation and re-creation, in the world and in the church. His statutes and laws are the rule of our lives, for humans are his creatures, subject to him, and obligated to respond in total obedience. In the church this view naturally led to the confession of the kingship of Christ. For just as in civil life God instituted the government on account of sin, so he anointed his Son to be king of Zion, the mountain of his holiness, and appointed him to be head over all things for the church (Ps. 2:6; Eph. 1:20; Phil. 2:9–11). Christ is not only a prophet who teaches by his word and example, not only a priest who atones by his sacrifice, but also the king who preserves and protects his own and to that end has been clothed with power in heaven and earth. He is king in a much more authentic sense than any secular ruler. He is that not only according to his divine nature but also according to his human nature. The human Christ Jesus has been exalted to sit at his Father’s right hand. He was all this not just from eternity and in the days of the Old Testament and during his sojourn on earth, but is still all this today and will be to the end of the ages. He is the same yesterday, today, and forever. Indeed, he is this now in the state of exaltation in a much richer sense than he was in the state of humiliation and in the time that preceded it. Granted, he had from eternity been anointed king and exercised this office, along with that of prophet and priest, immediately after the fall and up until his death on the cross; but on account of his humiliation God highly exalted him and gave him a name above every name. By his resurrection he was declared with power to be the Son of God, became Lord, received all power in heaven and on earth, and now reigns until he has completed the kingdom and put all his enemies under his feet. This kingship of Christ is twofold. On the one hand, it is a kingship of power (Pss. 2:8–9; 72:8; 110:1–3; Matt. 28:18; 1 Cor. 15:27; Eph. 1:21–22; Phil. 2:9–11; Heb. 1:6; 1 Pet. 3:22; Rev. 17:14). In order that Christ may truly be king over his people, the king who redeems, protects, and preserves them, he must have power in heaven and on earth, over Satan and the world. It is a kingship of power, subordinate to, and a means for, his kingship of grace. It does not mean that the Father has ceased to govern the world and that now all authority in the creation comes down from Christ and is exercised in his name. But, based on Christ’s perfect obedience, God has granted the Mediator the right and the power to gather his people together out of the world, to protect them against all their enemies, and to completely subdue those enemies themselves. God so rules the world that Christ may ask for the Gentile nations as his inheritance and the ends of the earth as his possession [Ps. 2:8]. In the event of Christ’s exaltation, the Father recognized his Son and appointed him as the heir of all things (Heb. 1:2). On the other hand, the kingship of Christ is a kingship of grace (Ps. 2:6; Isa. 9:5–6; Jer. 30:9; Ezek. 37:24; Luke 1:33; John 18:33ff. ; Eph. 1:22; 4:15; 5:23; Col. 1:18; 2:19). Inasmuch as this kingship is totally different from that of the kings of the earth, the New Testament much more frequently calls Christ “the head” than the king of the church. For it is a kingdom of grace in which Christ rules by his word and Spirit. His word comes to us from the past, binds us to the historical person of Christ and to the work he accomplished in time, and asks of us faith in the sense of assent and acknowledgment. But he who descended is the same as he who also ascended far above all the heavens [Eph. 4:10], is seated at God’s right hand, and dwells in us “with his divinity, majesty, grace, and Spirit and never again departs from us” [Heidelberg Catechism, Q&A 47]. It is the living Christ exalted to sit at the right hand of God who consciously and endowed with all power gathers his church, defeats his enemies, and guides the history of the world to the day of his parousia. As our Mediator, he is still always active in heaven and present by his Spirit on earth in church and in the offices, in Word and sacrament. 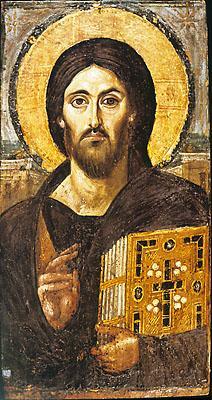 Christ is king according to both his divine and his human nature. Jesus is the resurrected and ascended human Lord of all things who fulfills God’s intention for Adam’s race. Christ is a king with power who subdues his enemies for the sake of his people. Christ is a king with grace who rules by word and Spirit. It is a gospel-kingship. May these truths fill you with love and adoration for our glorious king. Marvel before him and offer up your lives as a faithful service to the King who served us.